Use the form below to inquire about Exclusive Beach Resort at Pudhukkuppam . Use the form below to reserve for Exclusive Beach Resort at Pudhukkuppam . All these cottages are build from materials that naturally cools them. Most of them are sea facing and have private gardens. All rooms are unique and different because of the architecture and location. In an era when everyone is traveling frequently, chances are that at some point all hotels start to look alike in their outlook and feel. But this is something that you will not experience at this Exclusive Beach Resort at Pudhukkuppam. A fresh breeze of change from all the usual beach accommodations, The hustle, and bustle of the modern lifestyle are left far behind once you enter the gates of this unique, eco-friendly resort where organic living is the mantra of life. The architecture here is an effortless blend of traditional eco-friendly construction styles and modern accessories. Out of the 55 exclusive bungalows, no two are alike as each one is a bespoke design by artists, designers, and architects from across the world. Some bungalows have wooden walls with tile roofing, some are terracotta houses built with mud, a few have stilts supporting thatched roofs, some have open garden bathrooms sheltered by woven coconut leaves and a few are made of bricks. This Exclusive Beach Resort at Pudhukkuppam retains many old classic antiques from colonial houses, Chettinad palaces, and Kerala planter’s mansions adding to the soul of the interiors. Opulence and eco-friendly earthy living go hand in hand here. This exotic beach resort enjoys 700 meters of private beach and most of the accommodations are sea-facing. The greenery is accentuated by with swaying palm and coconut trees and tropical flowering plants. Solar energy is harnessed here while low consumption bulbs and organic linen also promote the harmony with nature. This Exclusive Beach Resort at Pudhukkuppam offers work studios for artists from around the world who choose to nurture their talents cocooned here. At every nook in this classic resort, exemplary work by these artists can be noticed. The spirituality of neighboring Auroville, Puducherry, and Chennai resonates in the air around here. The spa at the resort offers to revitalize Ayurvedic therapies and a special magic water treatment. Other facilities are a multi gym, volleyball court, jogging track, children’s play house, swimming pool, a souvenir shop, conference hall, open air auditorium, and electrical transport service. The restaurant at this beach resort serves healthy yet lip-smacking gourmet food cooked with produce from the in-house organic vegetable garden, dairy, and poultry farm. Seafood is supplied by local fishermen and you can savor delicacies of the Coromandel Coast at the seafood restaurant right on the beach. Private, custom-themed dinners can be arranged according to your request. The tariff for double occupancy is inclusive of breakfast. Extra persons including children above age 5 charged as applicable. Foreign tourists will also need to have proof of identity as per regulations. All foreign nationals will have to carry their passports with valid visas and other relevant documents. Peak season supplement applicable from 16th Dec to 28th Feb.
Day special rate applicable for 24th Dec & 31st Dec.
Check-in is 2.00 pm and check-out is 11.00 am. No show or cancellation within 14 days of arrival, will incur a cancellation charge for the entire length of stay. The house names may vary depending on the availability. Payment gateway/credit card/fee as applicable levied for all cancellations. Apart from relaxing in the cool sea breeze to the tune of waves lapping the shore there are plenty of activities in store for you. The spa is equipped to pamper you with Ayurvedic massages and therapies to ensure relaxation and rejuvenation. Set amidst a beautiful garden of Ayurvedic plants, aromatherapy herbs, and lotus ponds, the spa is huge and houses an Ayurvedic pharmacy, a medicinal laboratory, an aromatherapy steam house, a heated chlorine-free swimming pool, a multi-gym, a boutique, and a beauty treatment center. Along with ancient Indian Ayurveda techniques, recharge yourself with rejuvenating therapies like Swedish and Thai deep tissue massages and reflexology treatments at the spa. Watsu, a unique magic water treatment can be enjoyed at the spa here. Floating with the rhythmic movement of water is a combination of a light acupressure of energy points, stretching, rocking etc and mimics the feel of being inside the mother’s womb. This treatment releases tensions in muscles and joints and relaxes you physically and emotionally. The resort spa also offers hydrotherapy which is used to treat many diseases like arthritis, spondylitis, spinal cord injuries, and stroke or paralysis. Water treatments are with previous appointments only. Corporate functions, meetings, or weddings can be arranged indoors or at the gorgeous beach. The theme and setting will be arranged as per your requirements. This surreal beachside retreat is perfect for yoga and meditation. For active outdoor activity, guests can enjoy a game of badminton, cricket, volleyball, jogging on the indoor track or kite flying. 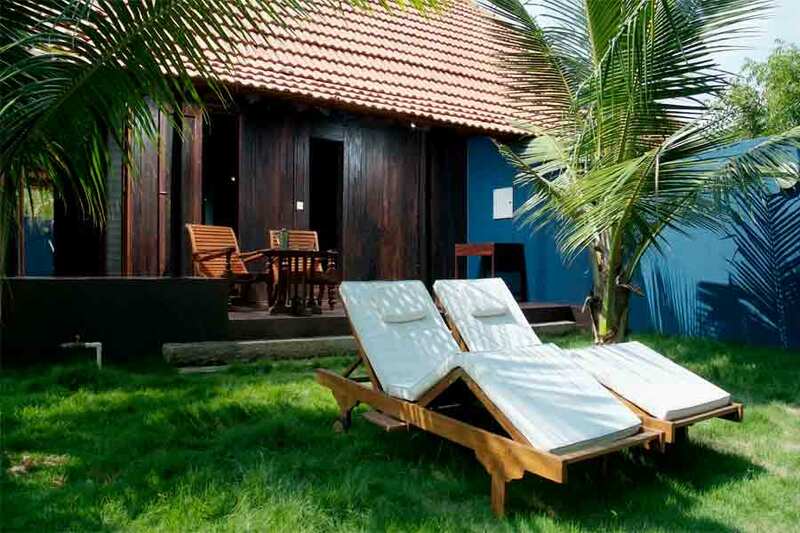 To kick back and relax, chill in the swimming pool that overlooks the Bay of Bengal. If you are not in a mood to hit the waters, dive into a book. The organic vegetable garden, poultry farm, and animal farm are open to guests. Children are can learn to milk the cows and take part in pottery classes. Other activities that can keep little ones busy are cycling, playing in a park, or play house while a cool sea breeze blows. Sightseeing trips to neighboring locations like Pondicherry, Auroville, Mahabalipuram, Cuddalore, and Chidambaram are a must-do. Travel assistance for local sightseeing is available here. Chennai is the nearest airport to Pudhukkuppam. Chennai to Pudhukkuppam is about 150 km (approx 3.5 hrs). From Chennai, drive south on NH 32. On reaching Tindivanam, drive east on the same road for about 30 km (approx 45 mins) to reach Pudhukkuppam.